This article considers nominally pinned joints (simple connections) which are used in multi-storey braced frames in the UK. This form of braced construction, with nominally pinned joints, is termed 'simple construction'. The article lists the types of simple connections that are most commonly used in the UK. It presents the procedures for their design to Eurocode 3 and discusses the relative merits of beam end connection types. The benefits of standardisation of connections are discussed for beam-to-beam and beam-to-column connections using fin plate and flexible end plate connections. Column splices, column bases and bracing connections are also discussed together with a brief mention given to special connections. 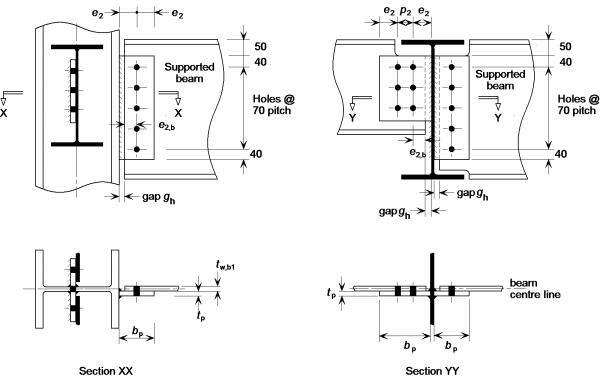 Simple connections are nominally pinned connections that are assumed to transmit end shear only and to have negligible resistance to rotation. Therefore do not transfer significant moments at the ultimate limit state. This definition underlies the design of multi-storey braced frames in the UK designed as 'simple construction', in which the beams are designed as simply-supported and the columns are designed for axial load and the small moments induced by the end reactions from the beams. Stability is provided to the frame by bracing or by the concrete core. Simple connections can also be needed for skewed joints, beams eccentric to columns and connection to column webs. These are classed as special connections and are treated separately. The design of simple connections is based on BS EN 1993-1-8 and its accompanying National Annex. The capacities of the connection components are based on the rules given in clause 3.6. The spacing of the fasteners comply with clause 3.5 and follow the recommendations presented in the 'Green Book' (SCI P358). ECCS publication No. 126 also provides useful guidance on the design of simple connections to Eurocode 3.
have sufficient robustness to satisfy the structural integrity requirements (tying resistance). BS EN 1993-1-8 requires that all connections must be classified; by stiffness, which is appropriate for elastic global analysis, or by strength, which is appropriate for rigid plastic global analysis, or by both stiffness and strength, which is appropriate for elastic-plastic global analysis. The initial rotational stiffness of the connection, calculated in accordance with BS EN 1993-1-8 , 6.3.1 is compared with the classification boundaries given in BS EN 1993-1-8, 5.2.2. Alternatively, joints may be classified based on experimental evidence, experience of previous satisfactory performance in similar cases or by calculations based on test evidence. The joint should be capable of accepting the rotations resulting from the design loads. The UK National Annex to BS EN 1993-1-8 states that connections designed in accordance with the 'Green Book' (SCI P358) may be classified as nominally pinned joints. The thickness of the full depth end plates have been limited to ensure the moment resistance is less than 25% of a full strength joint, and can thus be classified as nominally pinned. The UK Building Regulations require that all buildings should be designed to avoid disproportionate collapse. Commonly, this is achieved by designing the joints in a steel frame (the beam-to-column connections and the column splices) for tying forces. Guidance on the design values of tying forces is given in BS EN 1991-1-7 Annex A, and its UK National Annex. The requirements relate to the building Class, with a design value of horizontal tying force generally not less than 75 kN, and usually significantly higher. Full depth end plate details have been developed to provide an increased tying resistance compared to partial depth end plate details. Further details on structural robustness are presented in SCI P391 . The selection of beam end connections can often be quite involved. The relative merits of the three connection types (partial depth end plates, full depth end plates and fin plates) are summarised in the table below. Selection of beams and connections is generally the responsibility of the steelwork contractor who will choose the connection type to suit the fabrication workload, economy and temporary stability during erection. It is recognised that interaction with a composite floor will affect the behaviour of a simple connection. Common practice is to design such connections without utilising the benefits of the continuity of reinforcement through the concrete slab. However, SCI P213 enables reinforcement continuity to be allowed for in providing relatively simple full depth end plate connections with substantial moment resistance. In a braced frame, this resistance may be used to reduce the mid-span moment and deflection, facilitating the selection of a smaller beam. Simple connections are invariably cheaper to fabricate than moment-resisting connections, because they involve much less fabrication effort, particularly in welding. Giving specific guidance on costs is difficult, as a Steelwork Contractor's workmanship rates can vary considerably and are dependant upon the level of investment in plant and machinery. However, the main objective is to minimise work content. The material cost for fittings and bolts is small compared with workmanship costs which are dominated by welding content. In a typical fabrication workshop the cost of fabrication of connections may be 30% to 50% of the total fabrication cost. Standardised connections are efficient in their production. Steelwork Contractors equip their workshops with specialist machinery that increases the speed of fabrication, allowing them to produce fittings and prepare the members much more quickly than they would if the connection configuration were different each time. The standardised details mean the steelwork is straightforward to erect, which provides a safer working environment for the steel erectors. Due to the nature of most bolted joints, the connections are demountable at the end of the service life of the structure. The steelwork can be dismantled, reused or recycled, therefore reducing the environmental impact of the construction. In a typical braced multi-storey frame, the connections may account for less than 5% of the frame weight, and 30% or more of the total cost. Efficient connections will therefore have the lowest detailing, fabrication and erection labour content. The design procedures given below are suitable for either hand calculation or for the preparation of computer software. Designing connections by hand can be a laborious process and so a full set of resistance tables has been included in the 'Green Book' (SCI P358). Ensuring that the joint is detailed such that it develops only nominal moments which do not adversely affect the members or the joint itself. The joint should be detailed so that it behaves in a ductile manner. Identifying the load path through the joint i.e. from the beam to the supporting member. Checking the resistance of each component. For normal design there are ten design procedure checks for all the parts of a beam to beam or beam to column joint for vertical shear. A further six checks are necessary to verify the tying resistance of the joint. Beam to column connections must be able to resist lateral tying forces unless these forces are resisted by other means within the structure, such as the floor slabs. The table below summarises the design procedure checks required for partial depth end plates, full depth end plates and fin plates. The design procedures are described fully in the 'Green Book' (SCI P358). Typical flexible end plate connections are shown in the figure right. The end plate, which may be partial depth or full depth, is welded to the supported beam in the workshop. The beam is then bolted to the supporting beam or column on site. This type of connection is relatively inexpensive but has the disadvantage that there is little opportunity for site adjustment. Overall beam lengths need to be fabricated within tight limits, although packs can be used to compensate for fabrication tolerances and erection tolerances. End plates are probably the most popular of the simple beam connections currently in use in the UK. They can be used with skewed beams and can tolerate moderate offsets in beam to column joints. Flowdrill, Hollo-Bolts, Blind bolts or other special assemblies are used for connections to hollow section columns. Detailing requirements and design checks for partial depth and full depth end plates connections, which are applicable to beam-to-beam connections as well as beam-to-column connections, are comprehensively covered in the 'Green Book' (SCI P358). These include procedures, worked examples, detailing and design resistance tables. An End plate designer tool is also available. Standard flexible end plate details (full depth and partial depth end plates) are shown in the figure below, together with recommended dimensions and fittings. Fin plate connections are economical to fabricate and simple to erect. These connections are popular, as they can be the quickest connections to erect and overcome the problem of shared bolts in two-sided connections. A fin plate connection consists of a length of plate welded in the workshop to the supporting member, to which the supported beam web is bolted on site, as shown in the figure below. There is a small clearance between the end of the supported beam and the supporting column. In the design of a fin plate connection it is important to identify the appropriate line of action for the shear. There are two possibilities: either the shear acts at the face of the column or it acts along the centre of the bolt group connecting the fin plate to the beam web. For this reason both critical sections should be checked for a minimum moment taken as the product of the vertical shear and the distance between the face of the column (or beam web) and the centre of the bolt group. Both critical sections are then checked for the resulting moment combined with the vertical shear. Due to the uncertainty of the moment applied to the fin plate, the fin plate welds are sized to be full strength. 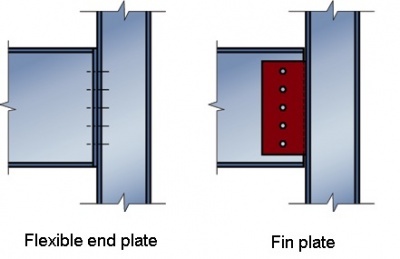 Fin plate connections derive their in-plane rotational capacity from the bolt deformation in shear, from the distortion of the bolt holes in bearing and from the out-of-plane bending of the fin plate. Note that fin plates with long projections have a tendency to twist and fail by lateral torsional buckling. An additional check to consider this behaviour is included in the design procedures for fin plate connections. The 'Green Book' (SCI P358) covers detailing requirements, design checks and procedures applicable to fin plate design. Worked examples and design resistance tables are also given in this publication. A Fin plate designer tool is also available. Increasing interest in the use of S355 for fin plates prompted questions about the stiffness of such connections – are they still nominally pinned? To address this question, BCSA and Steel for Life commissioned SCI to carry out research comparing the behaviour of fin plate connections with both S275 and S355 fin plates. The study concluded that as long as the standardised connection geometry presented in the Green Book is respected, 10 mm fin plates in S355 are classed as nominally pinned connections and may be used as an alternative to S275 plates. Further information is available in an article in the May 2018 issue of NSC magazine. Column splices in multi-storey construction are required to provide strength and continuity of stiffness about both axes of the columns. Typical bolted column splices used for rolled I section and hollow section members are shown in the figure on the right. Splices are typically provided every two or three storeys and are usually located approximately 600mm above floor level. This results in convenient lengths for fabrication, transport and erection, and gives easy access from the adjacent floor for bolting up on site. The provision of splices at each storey level is seldom economical since the saving in column material is generally far outweighed by the material, fabrication and erection costs of providing the splice. In the bearing type splice (see figure below) the loads are transferred in direct bearing from the upper shaft either directly or through a division plate. The 'bearing type' splice is the simpler connection, usually having fewer bolts than the non-bearing splice, and is therefore the one most commonly used in practice. When no net tension is present, a standard connection can be used, however BS EN 1993-1-8 imposes the requirement for the splice plates and bolts to transmit at least 25% of the maximum compressive force in the column. For bearing type splices, the tying resistance is likely to be the critical check. Splices categorised as non-bearing type (see figure below) transfer loads via the bolts and splice plates. Any direct bearing between the members is ignored, the connection sometimes being detailed with a physical gap between the two shafts. The design of a non-bearing splice is more involved, as all forces and moments must be transmitted through the bolts and splice plates. For non-bearing type splices, the minimum requirements in BS EN 1993-1-8 are very onerous, being based on member capacity rather than applied force. As splices are generally provided just above floor levels the moment due to strut action is considered insignificant. The moments induced in splices placed at other positions, however, should be taken into account. Column splices should hold the connected members in line, and wherever practical, the members should be arranged so that the centroidal axis of the splice material coincides with the centroidal axis of the column sections above and below the splice. If the column sections are offset (for example to maintain a constant external line) the moment due to the eccentricity should be accounted for in the joint design. Design checks required for bolted cover plate column splices as well as procedures, worked examples, detailing requirements and design resistance tables are available in chapter 6 of the 'Green Book' (SCI P358). This type of splice, consisting of plates which are welded to the ends of the lower and upper columns and then simply bolted together on site, is commonly used in tubular construction but may also be used for open sections. The most simple form of the connection is as shown in the figure right and is satisfactory as long as the ends of each shaft are prepared in the same way as for a bearing type splice. The possibility of load reversal should be considered, in addition to stability during erection and tying requirements. Although commonly used, it is difficult to demonstrate that cap and base splices meet the requirements of BS EN 1993-1-8 clause 6.2.7.1(14). If these types of splices are used, common practice is to ensure that the plates are thick, and that bolts are located close to the flanges to increase the stiffness of the connection. Extended plates, with bolts outside the profile of the section may be used. If cap and base plate splices are located away from a point of restraint, special consideration should be given to ensuring adequate stiffness so that the member design is not invalidated. 'Cap and base' or 'end plate' column splices are covered in chapter 6 of the 'Green Book' (SCI P358). Detailing requirements, design procedures, worked examples and design resistance tables are given. Typical column bases, as shown in the figure on the right, consist of a single plate fillet welded to the end of the column and attached to the foundation with four holding down bolts. The bolts are cast into the concrete base in location tubes or cones and are fitted with anchor plates to prevent pull out. High strength grout is poured into the space below the plate (see the figure below). Such column bases are often only subject to axial compression and shear. However, uplift and horizontal shear may be a design case for column bases in braced bays. A simple rectangular or square base plate is almost universally used for columns in simple construction. The base plate should be of sufficient size and strength to transmit the axial compressive force from the column to the foundation through the bedding material, without exceeding the local bearing resistance of the foundation. A Base plate design tool is available. Column bases are generally designed to transfer the force from the column to the base plate in direct bearing. Holding down systems are designed to stabilise the column during construction, and resist any uplift in braced bays. In some cases it is assumed that modest horizontal shear is also carried by the holding down bolts. The way in which horizontal shear forces are transferred to the foundation is not well researched. Some designers check the resistance of the holding down bolts, and ensure that they are adequately grouted. This practice has been successfully followed for portal frame bases, which carry a significant shear. Braced bays may have relatively high shear forces. Designers may opt to provide a shear stub welded to the underside of the base plate, though the recess may complicate the casting of the foundation, and special attention must be paid to the grouting operation. Design methods that cover this type of detail are given in the 'Green Book' (SCI P398). Shear between the column end and the base plate will be transmitted by welds between the column and the base plate. Welds may be provided to the web only, or around parts of the profile - it is generally found that the weld resistance is more than adequate for modest shear forces. Bracing members include flats, angles, channels, I sections, and hollow sections. Bracing arrangements may involve the bracing members working in tension alone, or in both tension and compression. In most cases, the bracing member is attached by bolting to a gusset plate, which is itself welded to the beam, to the column, or more commonly welded to the beam and its end connection as shown in the figure right. Bracing systems are usually analysed assuming that all forces intersect on member centrelines. However, realising this assumption in the connection details may result in a connection with a very large gusset plate, especially if the bracing is shallow or steep. It is often more convenient to arrange the member intersections to make a more compact joint and check locally for the effects of eccentricities which are introduced. Bracing connections are generally made with non-preloaded bolts in clearance holes. In theory at least, this allows some movement in the connection, but in practice this is ignored in orthodox construction. In some cases it may be that movement on reversal is unacceptable - preloaded connections should be used in these circumstances. Check the components in the connection. Design rules to determine the resistance of the gusset plate are given in 'Green Book' (SCI P358). A Gusset plate design tool is also available. Steelwork connections for simple construction, illustrated above, will generally produce the most economic steel frame. A departure from these connections will inevitably result in an increase in overall cost. The increase in detail drawing, fabrication and erection costs can be more than 100% if non standard connections form the majority of the connections used. The need for special connections can often be avoided by judicious selection of member sizes. A minimum weight structure is unlikely to be the most cost effective. It is therefore good economic practice to ensure that steelwork can be placed with centrelines on established grids. The top flanges of beams should, where possible, be at a constant level, but this is less critical to cost than eccentric connections. When designing special connections, it may be possible to use a modified version of one of the standardised connections given in the Green Book, subject to additional design checks. Design principles and component sizing rules given in the Green Book should be incorporated in connection design as much as possible. Typical examples of situations where special connections are required are presented in the 'Green Book' (SCI P358). ↑ ECCS Publication No. 126 European Recommendations for the Design of Simple Joints in Steel Structures. J. P. Jaspart et al. 2009.